Inventory We are a resale marketplace, not a box office or venue. Ticket prices may exceed face value. This site is not owned by Fox Theater Atlanta . 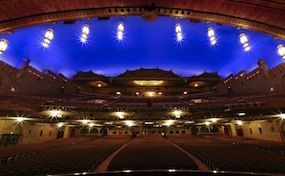 Fox Theatre Atlanta is the premier location to catch all the best traveling Broadway shows and theatrical performances. The Fox Theater Atlanta box office is located at 660 Peachtree Street NE in Midtown. The theater opened in 1929 and has a seating capacity of 4,678. Fox Theatre Atlanta tickets have included many popular shows like Wicked, Jersey Boys, Mamma Mia!, Billy Elliot, Les Miserables and more. The Fabulous Fox Theatre also has played host to a wide variety of concerts including Pearl Jam, Neil Young, Mumford & Sons, Adele, and Zac Brown Band. Theater-Atlanta.com is in no way affiliated with any official website, primary supplier, or venue. We are an independently owned and operated site concentrating in all online sales in the secondary market. Ticket prices may be well below or above face value and can fluctuate quickly with demand. To order tickets for all Fox Theatre Atlanta events on our site you can follow the steps through checkout or pick up the phone and call our friendly operators at anytime.